In this lesson, we'll take a look combining Neocolor II wax pastels with colored pencils to create a realistic drawing of a cupcake. We'll discover that by layering wax pastels, we can save a bit of time with our colored pencil applications. The process of layering colored pencils can be a time consuming endeavor. In order to build up depth in our color and create a rich and solid application, many applications of the pencils are required. But by creating a base application with water-soluble wax pastels, some of this effort can be saved without compromising the richness and depth of color. The term "pastels" may be bit misleading here. A better description would be "wax crayons", even though they are described as "pastels". When we think of pastels, we typically consider oil pastels or soft pastels. But in the case of wax pastels, the binder is wax, instead of oil or gum arabic. Wax pastels are very similar to a crayon, although more pigmented. The wax is also softer, allowing for heavy coverage without much pressure. Not all wax pastels are created equal. Some are water-soluble, as is the case with Neocolor II, but others are not (Neocolor I). By adding a bit of water with a brush, the pigment left by water-soluble wax pastels can be easily spread over the surface. Water-soluble wax pastels work well with wax-based colored pencils and can be used to cover large areas quickly or create a nice base for subsequent colored pencil applications. They can also be applied directly over the top of colored pencils without much loss of color intensity. We'll start the process by drawing the contours of the cupcake with a "5H" graphite pencil. Any graphite pencil can be used, but a lighter pencil may prevent any of the colored pencil applications from mixing in, producing grays. The drawing is created on Canson Mi-Tientes pastel paper, using the blue-gray tone. The less "toothy" (textured) side of the paper is used. We'll start with the cherry and work our way outward. Scarlet (Neocolor II) is lightly applied to the body of the cherry, with a bit of white for the lightest areas. A touch of black is applied on the shadowed side. Using a brush with a small amount of water, the colors are "activated" and spread to fill up the shape. The area dries very quickly, allowing for colored pencil applications to be applied over the top. Crimson Lake and Crimson Red (Prismacolor Premiere) are applied over the body of the cherry. Tuscan Red is used to darken tones and white is applied in locations of highlight. Colored pencil applications are then burnished with a colorless blender. The shadowed areas within the cherry are darkened further by applying Dark Umber and a bit of Indigo Blue. The reds are intensified with additional applications of Crimson Red and the highlights are enhanced with White. The stem begins with an application of yellow-green wax pastel. This application is then activated and spread with water. The color is intensified with an application of Apple Green. Dark Umber is applied on the shadowed side of the stem, darkening the value. Terra Cotta is also applied to add a little variety, before applying Cream to the side of the stem closest to the light source. These applications are then burnished with the colorless blender. The icing is addressed in the same manner as the other sections by applying an application of the wax pastel and then activating it with a small amount of water. Over the top, we'll begin to create a few areas of slightly darker value by applying 20% Warm Grey. French Grey is applied in areas to make the value a little darker. Highlights are strengthened with an additional application of white. This process is repeated on the lower portion of the icing. A touch of Cream is added to warm up the color and then burnished with the colorless blender. The cake portion of the cupcake begins with an application of Brown with the wax pastels. This area is activated with a bit of water before applying textural marks with Cream, Terra Cotta, and Dark Umber. Darker values in this section exist mainly in the areas of shadow underneath the frosting and just above the paper. These areas are addressed with Dark Umber before being burnished with the colorless blender. Then it's time to move on to the paper section. Alternating applications of brown and black are applied with the wax pastel and then activated with a small amount of water. The darker shadows within the paper are darkened with a combination of Dark Umber and Indigo Blue. The highlights are addressed with Cream and White. Color pencil applications are then burnished with a colorless blender in order to smooth the texture. 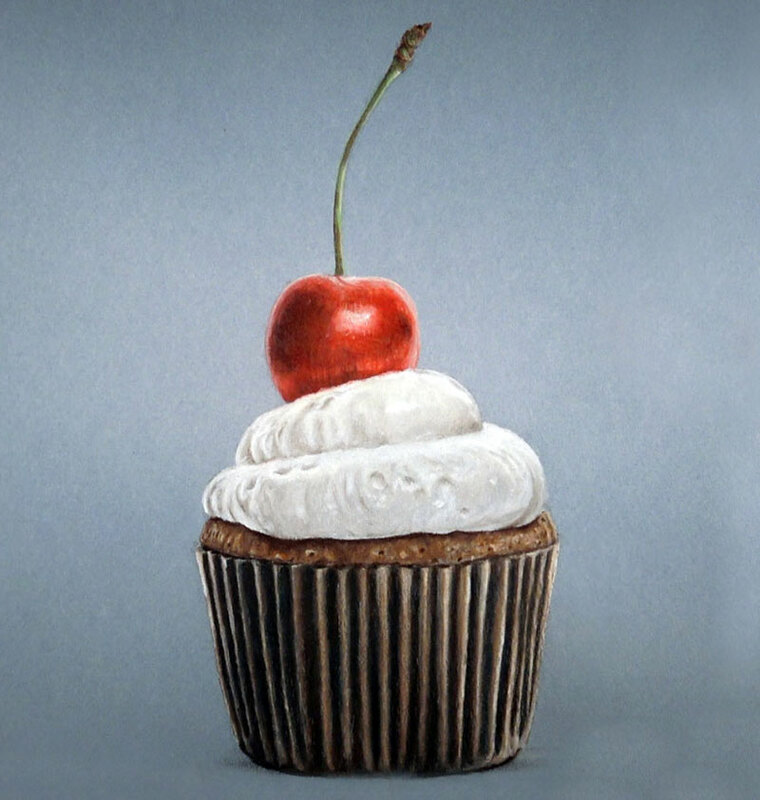 A bit of cast shadow is added underneath the cupcake with a bit of compressed charcoal and then blended gently with a blending stump to complete the drawing.